With vendors selling specialty dishes daily on every street corner, you don’t stay hungry for long in Vietnam’s Ho Chi Minh City. Street food is well and truly at the heart of this bustling city, but with so much on offer it’s difficult to know what to choose. 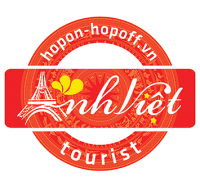 Enjoy Hop On Hop Off VietNam to know about some interesting street food, you have to try on your trip in District 1, Ho Chi Minh City, Vietnam. 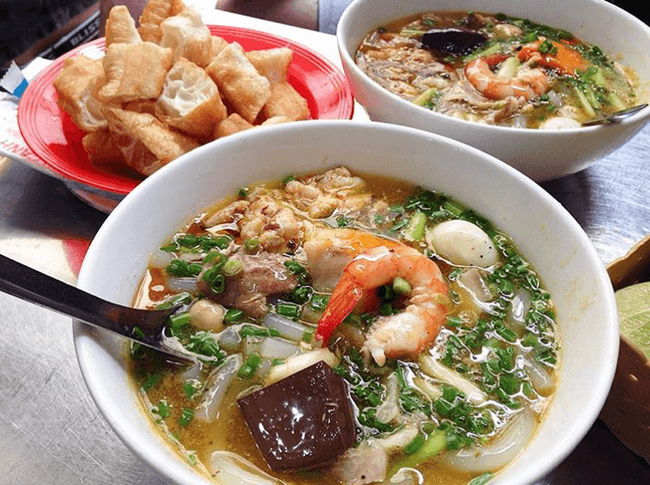 Banh canh cua are Vietnam’s version of udon, a thicker noodle that can be made with either tapioca flour, rice flour, or a combination of the two. The cua in this soup is crab, and the result is a viscous crab soup with thick noodles — not for those who shrink from goopy foods. Thickened with tapioca flour (and thus gluten free) it’s a satisfying meal for those who like their food consistencies to be adventurous, and with chillies, green onions, and fresh lime on top, a very tasty bowl. 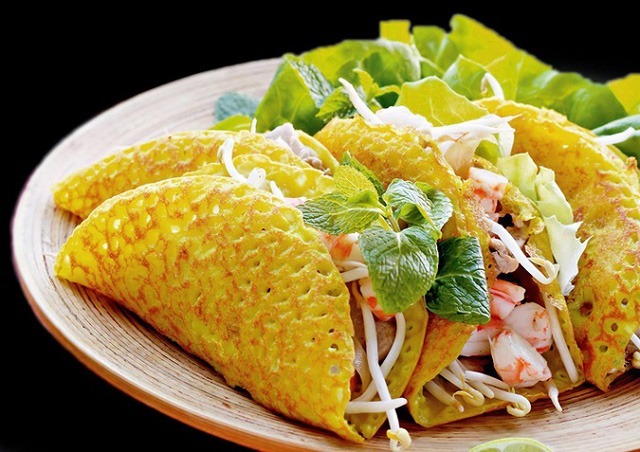 Banh xeo is a made from rice flour and coconut milk colored with turmeric and packed with a standard filling of mung bean paste, shell-on prawns, bean sprouts, and slices of boiled pork. The batter gets evenly spread across a large piping hot wok with a generous amount of oil, creating a crispy exterior that is folded in half when fully cooked. The result is a thin and savory pancake. You’ll hear banh xeo long before you see it. That’s because when the batter hits the pan, it crackles in a loudly audible way, alerting its existence to a hungry customer. 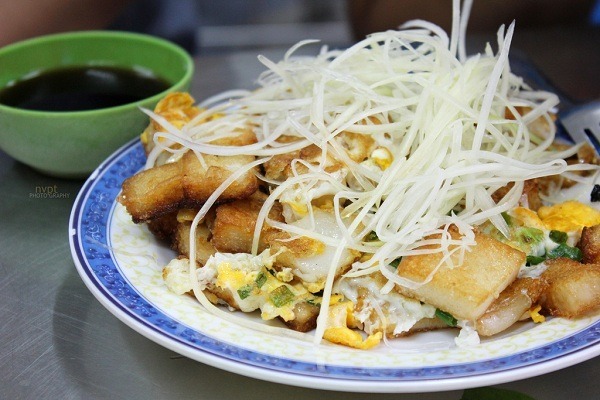 Banh xeo, which literally translates into “sizzling cake,” is a sensorial experience across the board. From the hissing noise as it fries to the brazen canary yellow batter, the scent of a luscious banh xeo divulges the greatness that is about to hit your taste buds. 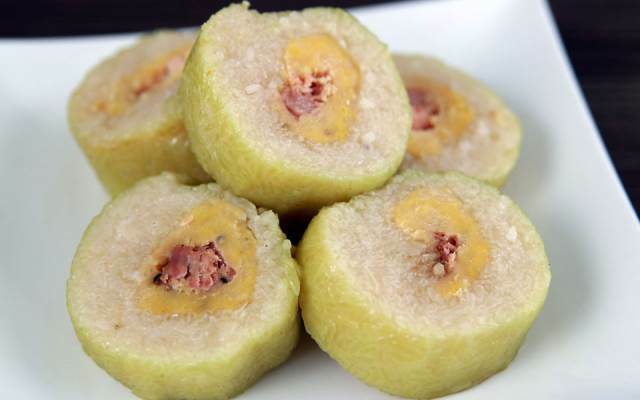 And it’s important to mention that banh xeo is Vietnamese finger food. That’s right, you’ll be wrapping up these slices in an array of herbs and dipping them into nuoc cham, sweetened fish sauce. Prepare to get your hands dirty. 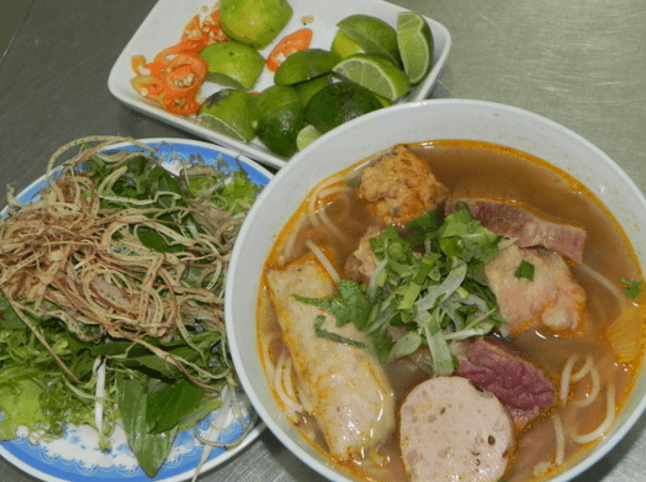 Bun bo Hue is made with lemongrass and chilli, its broth both citrusy and strong, laden with thick cuts of meat. 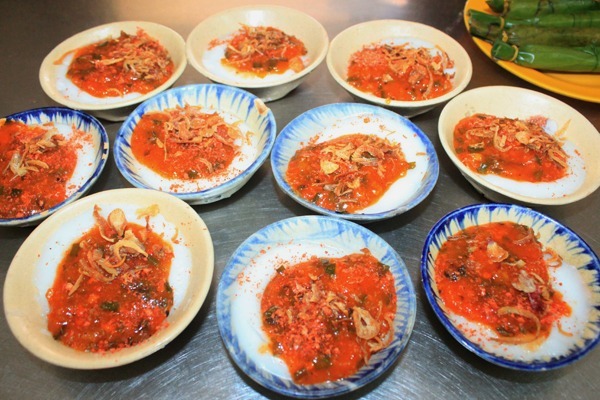 Paprika or anatto oil render the broth its fiery orange colour, and fermented shrimp paste lends a complicated layer of taste, one my Western palate was not acquainted with before trying the soup. These ingredients have been in other dishes I’ve tasted, but for some reason, this soup from the former imperial capital of Vietnam manages to bring them together in magical ways. 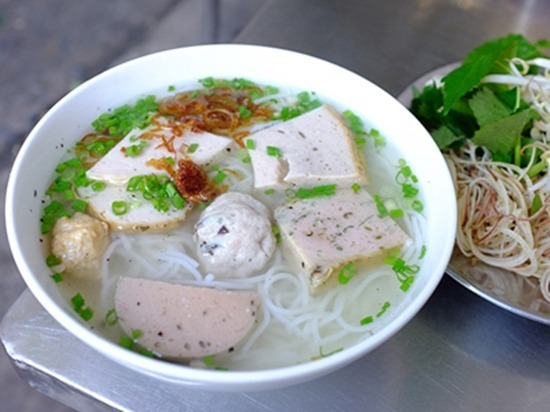 As with many of the meals in Hanoi that were taken to Saigon, what is normally a breakfast or early lunch food up north is an all-day treat in Saigon. While some bun cha joints are open early only, most will be full around lunch and dinnertime as well, hungry diners piling bowls with fresh herbs and smoky pork. This dish, a fave among my friends, comprises seasoned pork patties and thin slices of pork belly, both grilled until crispy and served in a bowl with sweet fish sauce, slices of young papaya and carrot, and garlic. 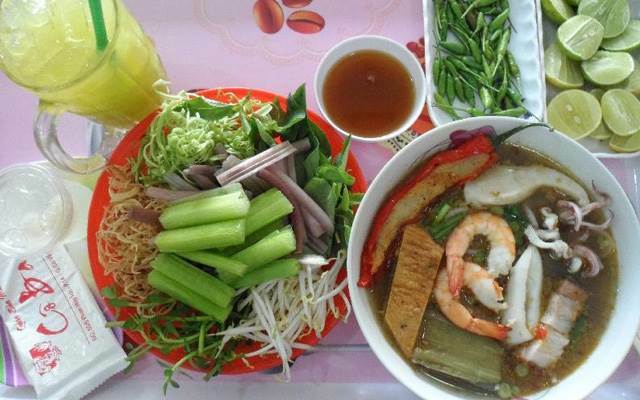 On the side, a bowl of plain rice noodles (the “bun” part of the name) and a big basket of fresh herbs like perilla, mint, and stinky fish herb. To eat, a bit of everything goes into your serving bowl: a handful of noodles, some pieces of pork, spoonfuls of the sweet fish sauce and herbs. If you like perilla as much as I do, you’ll need to ask for seconds. I’ve tried quite a few places around town but this one on Mac Dinh Chi remains my fave. It’s busiest at lunch time, and closes at 8pm. 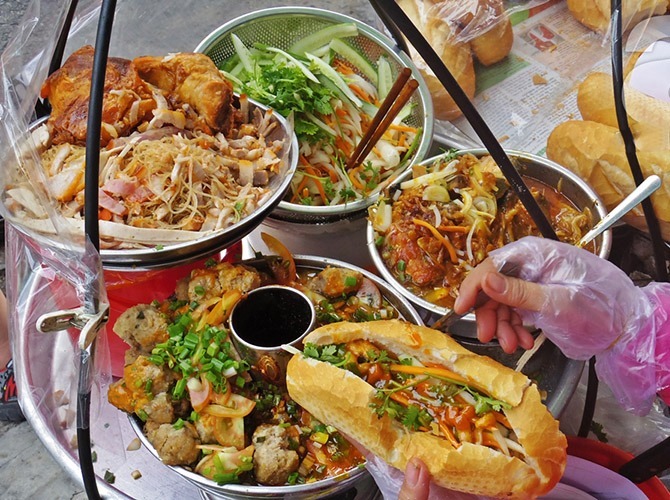 This bun mam stand is also close to Ben Thanh market, but it is often full of locals. Bun mam is kind of like a seafood noodle stew. The noodles included are usually rice vermicelli, and the ones I had in my bowl were kind of rounder and slightly chewier than the noodles I had, for instance in bowls of pho, which were more silky and soft.Also, unlike pho that has a thin clear broth usually prepared by boiling bones and meat with herbs, the soup stock used for bun mam has a far different look and taste.The broth is flavored, most importantly with fermented fish sauce. Bun moc has been my go-to soup when I had no idea what else to eat, when my tastebuds were overwhelmed with the variety of other meals throughout the day and just wanted a simple bowl, with savoury pork and mushroom broth. Broth aside, the soup’s fun lies in its accoutrements — slices of cha lua (a pork meatloaf coated in a cinnamon outer layer), slices of thin pork meat, and meatballs made of pork. Despite being a pork festival, it’s actually quite light, and the thin rice noodles compliment the meat well. The soup is topped with fried shallots and fresh cilantro. Most tourists haven’t heard of bun moc, but it’s a nice counterpoint to the strong flavours of the pork and rice dishes below. The few kids I’ve brought seem to love it too, so it might be a good starter dish if you are travelling with a family. A hark back to the years of French Indonesia when Vietnam was under colonial rule, this French-Asian fusion sandwich is one of the nation’s favourite snacks – think Subway taken to a totally different level. A Viet-style French baguette – made with a mixture of wheat and rice flour so it’s light and crispy in texture – is packed with cuts of roast pork, rich pate, pickles, fresh chilli and aromatic coriander. It is then finished with a splash of soy. The sweet version of this savoury street food is more popular in the south, where sugar and desserts are much more commonly enjoyed. To make it, banana and sweet red beans are placed in the middle of some flattened sticky rice, which is then wrapped up in a banana leaf and grilled on a BBQ. Once golden, the sticky rice-covered banana is taken off the heat, cut up into chunks and served with a custard-like sauce made from coconut milk. It is then topped with a sprinkle of sesame seeds. 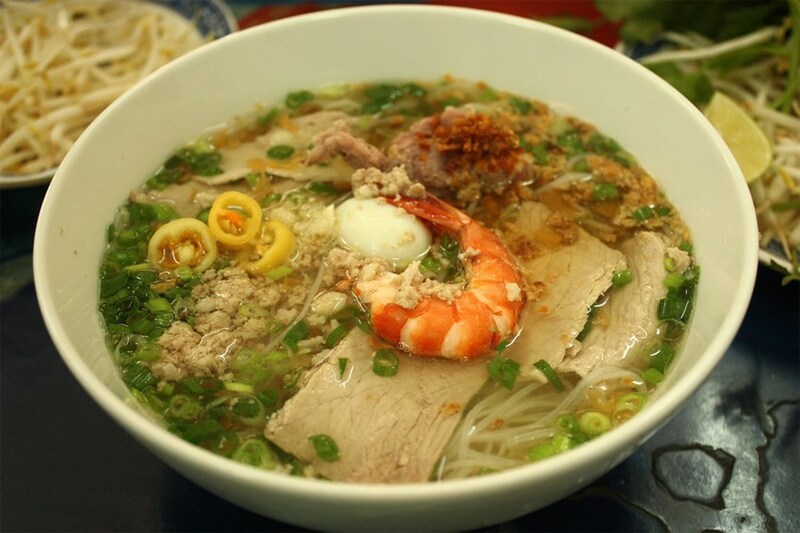 Hu Tieu is a noodle-in-soup dish very popular among Vietnamese especially in the South. 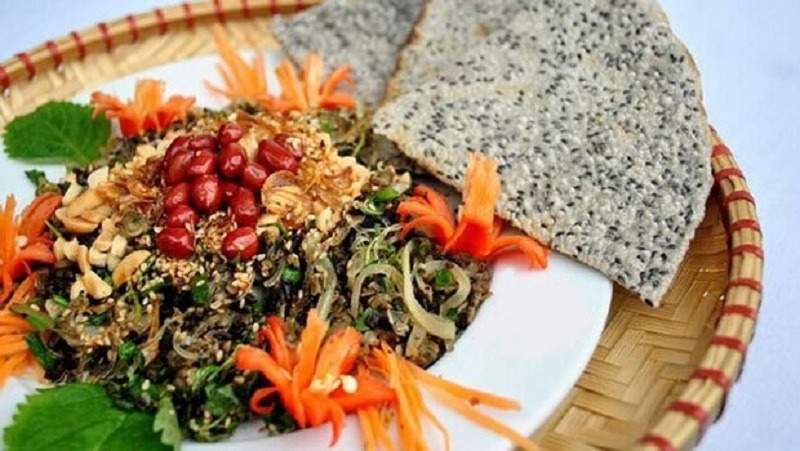 No doubt you have heard of this Southern Viet creation, and there are many non-Viet already discovering it. 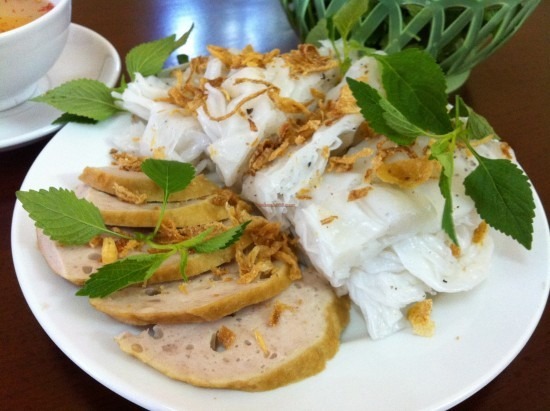 No it’s not pho, and what are we doing talking about hu tieu in a pho blog anyway? 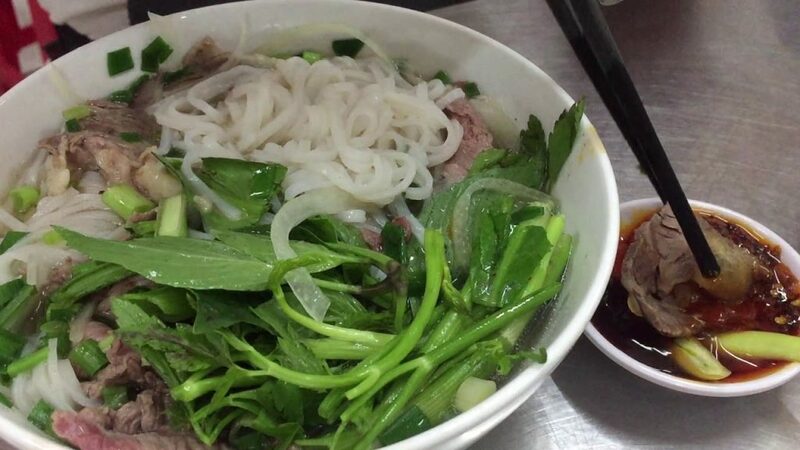 The reason is there are some confusions about what hu tieu is and what it is not, due to the common noodles sometimes used between the two. Plus I’ve always wanted to give my own take on hu tieu so here’s my chance to put hu tieu in its rightful place. There’s nothing that represents Vietnamese food more than the iconic Pho Bo, an aromatic beef soup, the thin slices of beef, the silky thin rice noodles and the fresh herbs you add to enhance the flavour. Ho Chi Minh Pho (Saigon) pho is the one we are more used to seeing in other countries, which is a beef broth, usually mix in with other ingredients like dried squid and seasonings to give it a flavoursome broth. 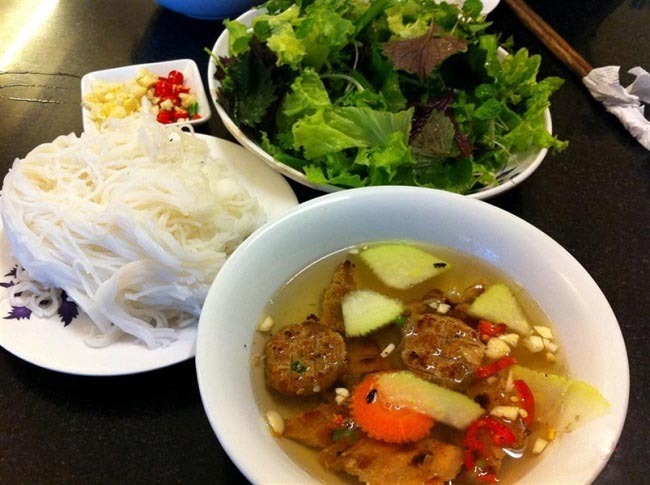 Another special trait of Saigon Pho is the amount of condiments on the side for you to enjoy your Pho, usually in the form of basil, beam sprouts, rice paddy herb, sawtooth herb, lime, chili sauce and hoisin sauce. This is something that is not common with Hanoi Pho, which you will see more later in this post. After trying numerous places – ranging from mediocre pho to good ones.